Crete is a great, yet affordable, place to spend your summer vacation. As a destination, Crete, provides everything that a demanding traveler needs, in order to spend a relaxing week -or more-. Discover more than 300 beaches, where many of them are secluded. In Crete the sun is shining 300 days a year. That is awesome, for people that like the sun. What about other people that hate the sun, or just prefer a “London” weather everyday. In this guide, we will tell you whether you should come to Crete or not, depending on what things you like to do in your every day life. Did you know that Crete has at least 5 beaches that reminds you the Caribbean? Elafonissi, Balos, Falassarna, Frangokastello and Chrissi Island are the beaches with white sands, clear waters and friendly natives. We will let some pictures speak by themselves. How could somebody resist to a delicious plate of Moussaka? Who would choose ketchup over tzatziki as a dressing? Or choose a hamburger over Souvlaki Pita? Who would say no to a Greek Salad with a beer in a hot summer day? With 1046 kilometres of coastline and 300 beaches, we are sure that at least one incredible beach is near you. Once you swim in of them, you will never spend a day without swimming. If you are bored of that, choose another destination. In Crete you can visit all 33 museums (or antiquities sites) or you can visit at least one. 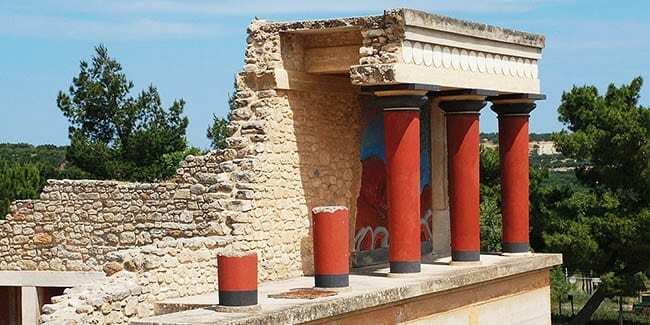 Knossos Palace, as Crete was the capital of the Minoan Civilisation. The marks of this civilisation are obvious to every single traveler. The old city of Chania, the old city of Rethymno and the Koules Fortress by the port of Heraklion are some of the sites you cannot miss. Having a GPS Sat Nav in Crete is like having a hand of god next to you pointing you the right direction. Crete’s roads are not ideal. So do the signs on the roads. As we have written in the past on How to use a GPS Sat Nav in Crete , knowing how to handle such device is great. Of course a road map (on paper) will do the job but who uses a map nowadays. By the way, here is a Simple Guide to help you adjust to the Greek driving style. In Crete, we do not ski. We do not ski at all. Period. We do not even know how a ski resort is like. Cretans like snow for just about 2-3 hours a year. Every winter, when Anogeia Mt or Lefka Ori are snowy enough, Cretans visit these towns to play in the snow and create a snow-man. Still, we enjoy that once or twice a year. Crete is not snow lovers. We are sure that you will love everything in Crete, so be ready to plan your next trip to Crete really soon.